If you want to get to know a new culture and some beautiful places the new pick of our deal hunters will be a dream for you, so book this flight from San Francisco to Amman for $878 r/t with taxes and fees. Book the multiple airlines airfare we have found operated by Air Canada and Lufthansa and save at least $76 compared to all the other airlines we have checked. Though this deal is originally provided by Faregeek, it was found on Travelgrove, so start your search there, but check other sites as well so you can make sure you have the cheapest Amman flight. Start your flight to Jordan from San Francisco International Airport (SFO) on January 22 2015 and return one week later from Queen Alia International Airport (AMM). The flight has two stops on its way to Amman, one in Calgary and one in Frankfurt while on the way back only one in Frankfurt. 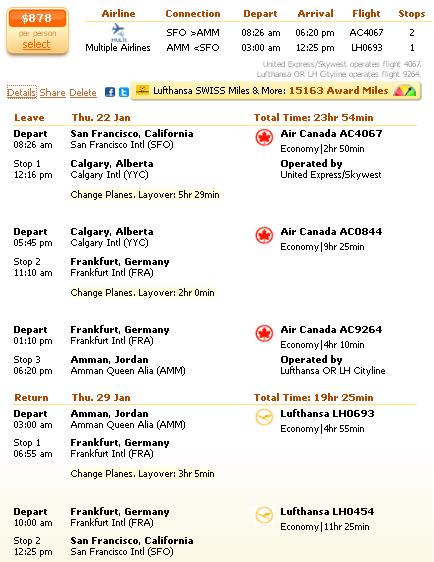 Note that Lufthansa SWISS Miles and More will give you as much as 15,163 award miles for booking this airfare. In the table you will find the top 5 airfare deals for the San Francisco to Amman route. Take a look and see how much you can save with the multiple airlines fare featured in the post. This entry was posted on Thursday, December 25th, 2014 at 4:30 am and is filed under Airfare Deals. You can follow any responses to this entry through the RSS 2.0 feed. You can leave a response, or trackback from your own site.